Utilities sector equity fund can be one of the defensive sector stock fund to invest during the economic crisis or bear market. These utilities sector funds provide regular dividend and additional growth of capital. One of this top rated utilities sector funds is described below. 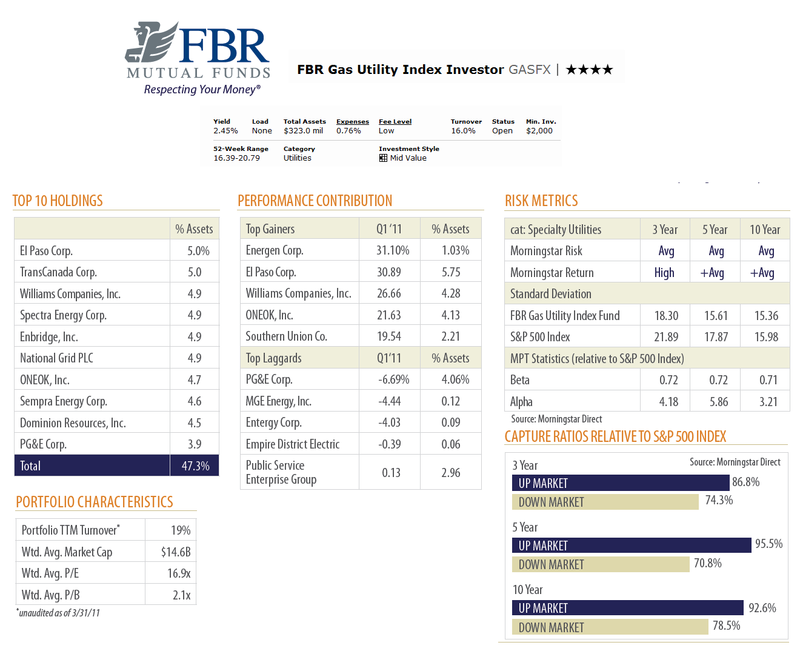 The FBR Gas Utility Index fund objective is to provide income and capital appreciation. This FBR fund intends to provide investment results that replicate the performance of the American Gas Association Stock Index. This index maintained by the American Gas Association, a national trade association of natural gas companies. It invests under regular circumstances >85% of net assets in the common stock of companies that have natural gas distribution and transmission operations. Since 2001, Winsor Aylesworth has been the lead manager of this FBR Fund. The fund’s expense ratio is 0.76% per year. This expense fee is lower than the average expense ratio of utilities category fund which is 1.39%. 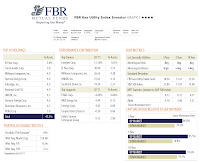 The FBR GASFX fund is a no load fund and has no front-end sales load fee. The fund’s total net assets are $322.95 million. This best rated fund also has a dividend yield of 2.45%. There are around 81 brokerages which offer this GASFX fund, such as JP Morgan, T Rowe Price, Td Ameritrade Inc, Vanguard NTF, Royal Alliance, Ameriprise Brokerage, Dreyfus NTF, Robert W. Baird & Co, Ameritas NTF, Firstrade NTF, Matrix Financial Solutions, etc. Investor will need $2,000 minimum initial investment to invest in the regular brokerage account of this fund and $1,000 for retirement account (IRA). There is no other class available beside this no-load class. As of March 2011, this fund has a total of 63 holdings. The top ten holdings represent 47.3% of the total portfolio. They are El Paso Corp (5.0%), TransCanada Corp (5.0%), Williams Companies Inc (4.9%), Spectra Energy Corp (4.9%), Enbridge Inc (4.9%), National Grid PLC (4.9%), ONEOK Inc (4.7%), Sempra Energy Corp (4.6%), Dominion Resources Inc (4.5%) and PG&E Corp (3.9%).